Spiky bits. What can you do with them? They’re very organic, in a prickly, Rodney Matthews sort of way. 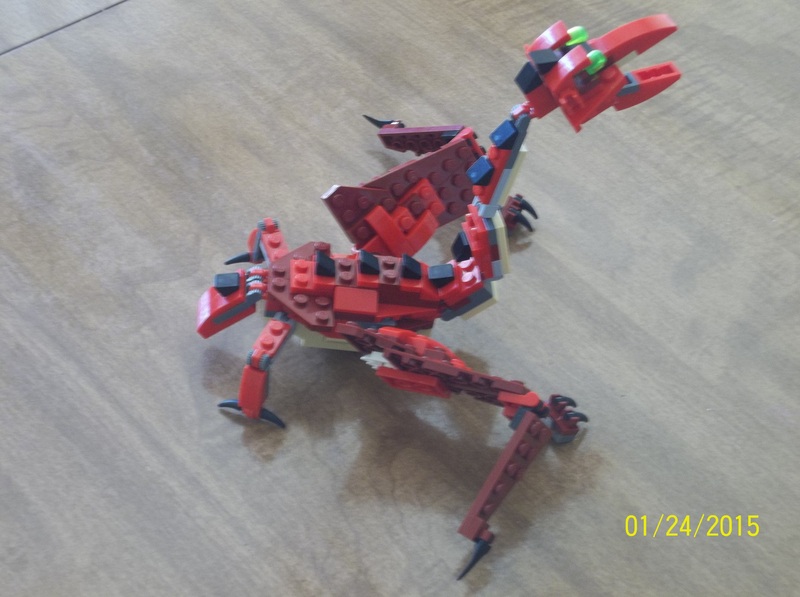 On the 31032 Red Creatures set in which I got them, they were the claws and horns of the dragon, the teeth of the snake and the fangs and claws of the scorpion. 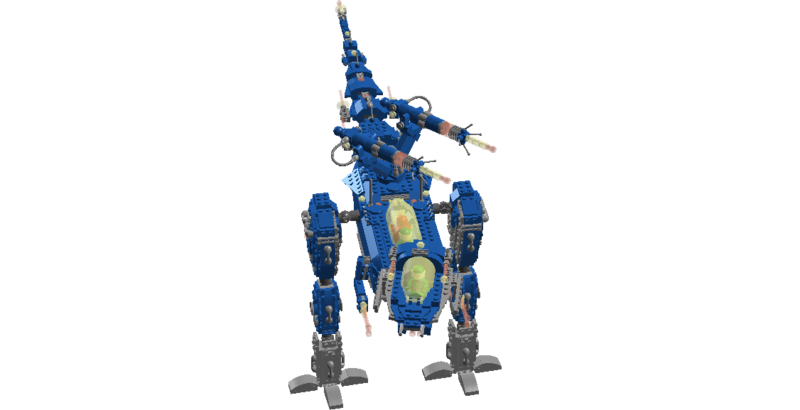 The small piece’s official designation is “horn”, and indeed, they look very menacing as hornlike decorations on the Lego Castle horse’s head armour. The larger piece is officially a “tooth”, and is a lot more bladelike than the small round “horn”. 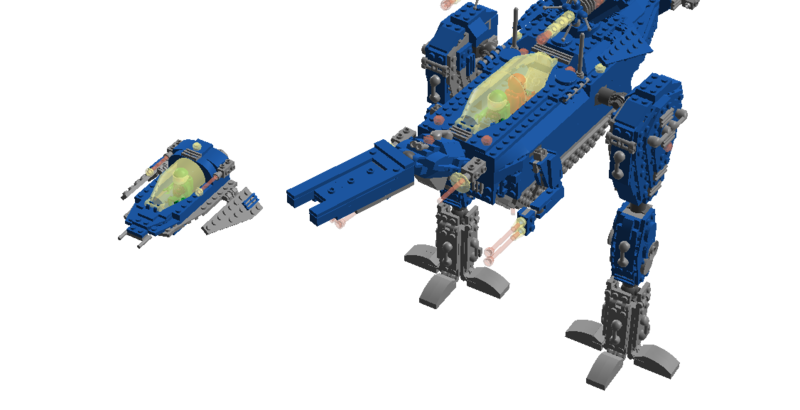 They’ve been robot claws in the wonderful Neo-Classic Space Exo-Suit (I want this set! ), and they’d make an excellent decorative battlement fringe on an evil knight’s castle. But that’s not what I built first. Following on from my Quetzalcoatlus, I guess I was in dinosaur mode or something, because all I could think was “Kentrosaurus”. Kentrosaurus, for those uninitiated into the mysteries of the Dinosauria, is probably the second most famous member of the Stegosaur group. If you’ve heard of only one Stegosaur that isn’t Stegosaurus, chances are good that it’s this one. Unlike its larger and more famous cousin, Kentrosaurus lacks a proper thagomizer (as the cluster of tail spikes has come to be known); instead having paired spikes at intervals along its tail, from the tail-tip to halfway up its back. 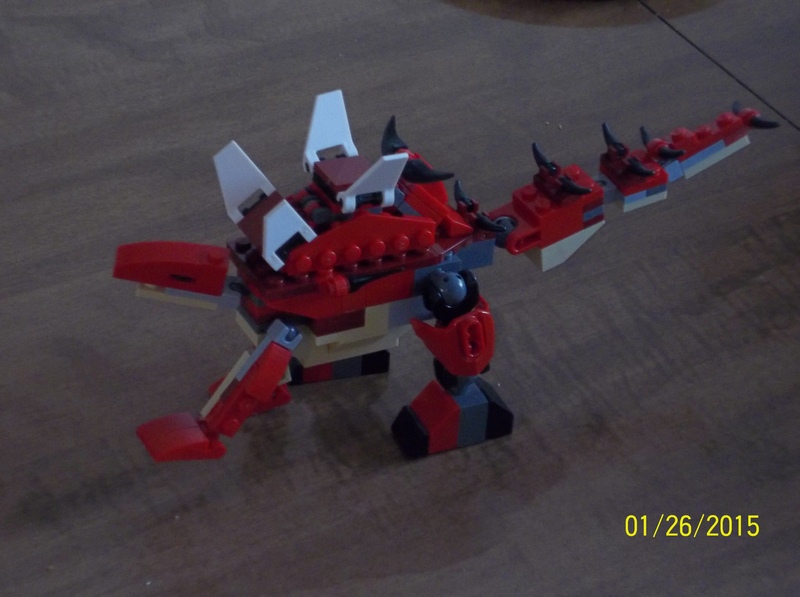 So it only has plates along the front half of its back, not all the way down like most Stegosaurs. In addition, it bears a pair of wicked defensive shoulder spikes to help fend off predators. 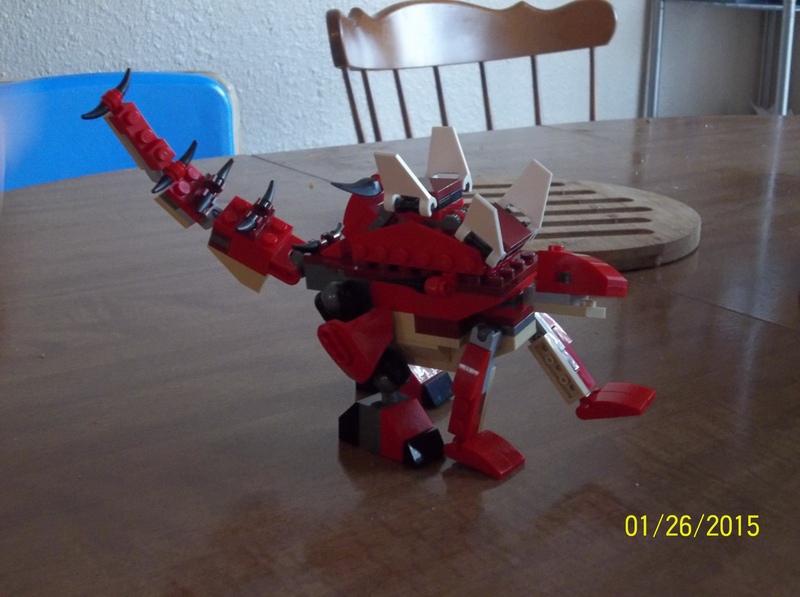 So I decided that Stegosaur spines was really rather a good use of all these wonderful spiky bits, and built a Kentrosaurus. It would have looked better with black plates to match the spikes (or white spikes to match the plates), but you work with what you have. 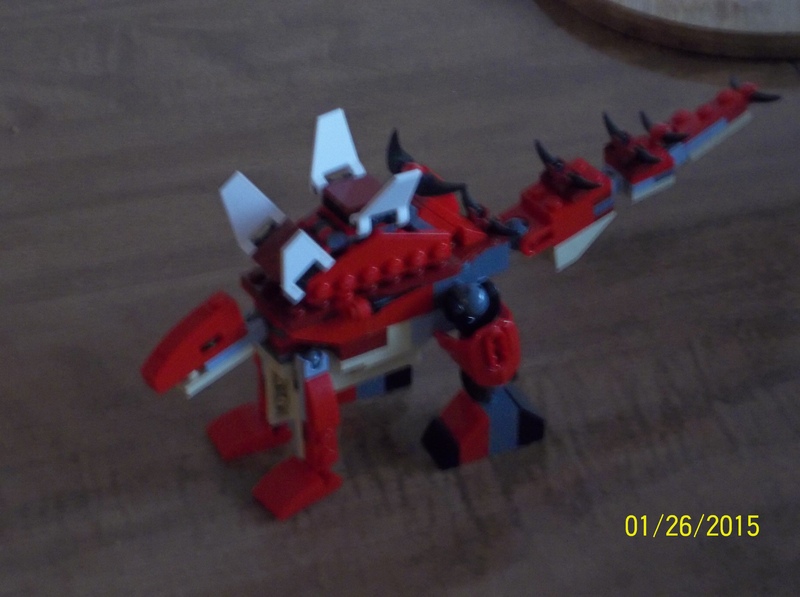 Unlike my previous Quetzalcoatlus, this Kentrosaurus isn’t remotely minifigure scale. 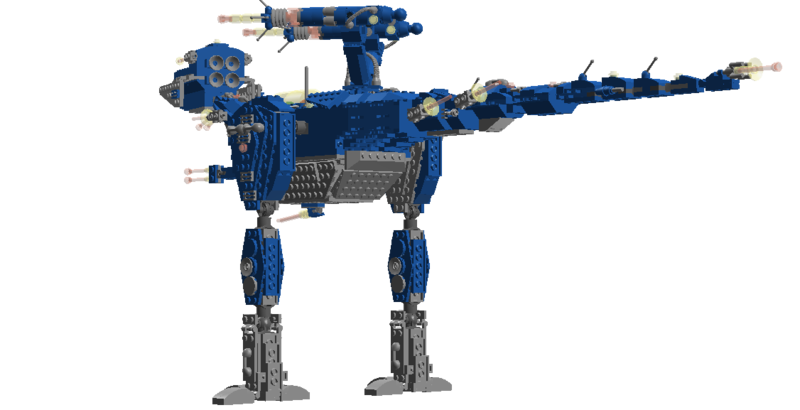 For that, I’d need to shrink it to about the size of a Lego horse, because Kentrosaurus wasn’t all that big. 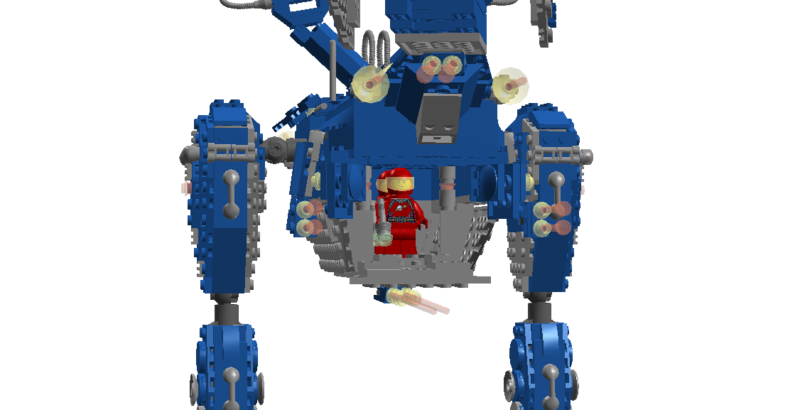 Still, there’s no law requiring that I build to minifig scale. 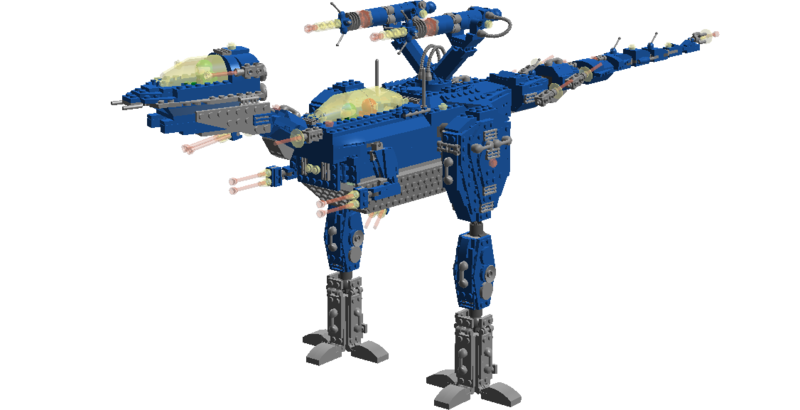 This entry was posted in Prehistoric beasts and tagged Dinosaurs, Kentrosaurus, Lego, Lego dinosaurs, Stegosaur on February 1, 2015 by geoffhorswood. 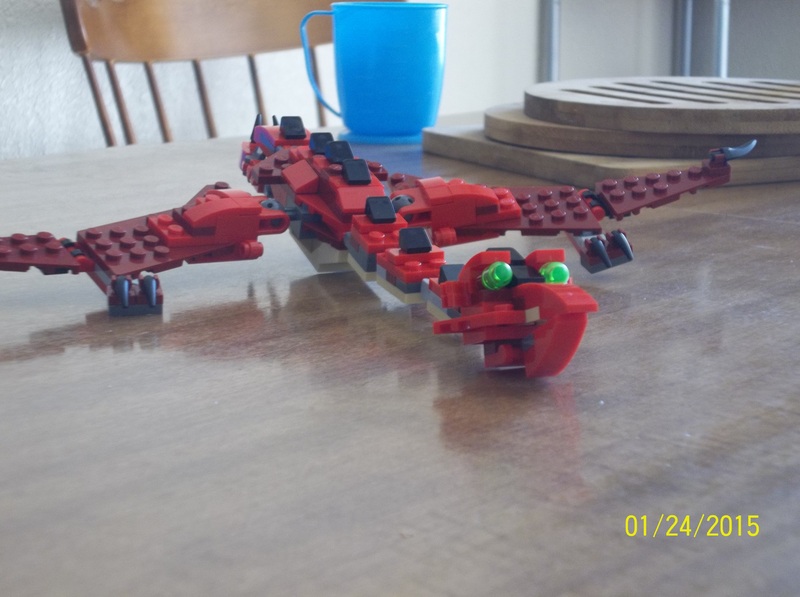 I recently decided to reward myself for a difficult job completed by splurging just a little on the 31032 Red Creatures set. 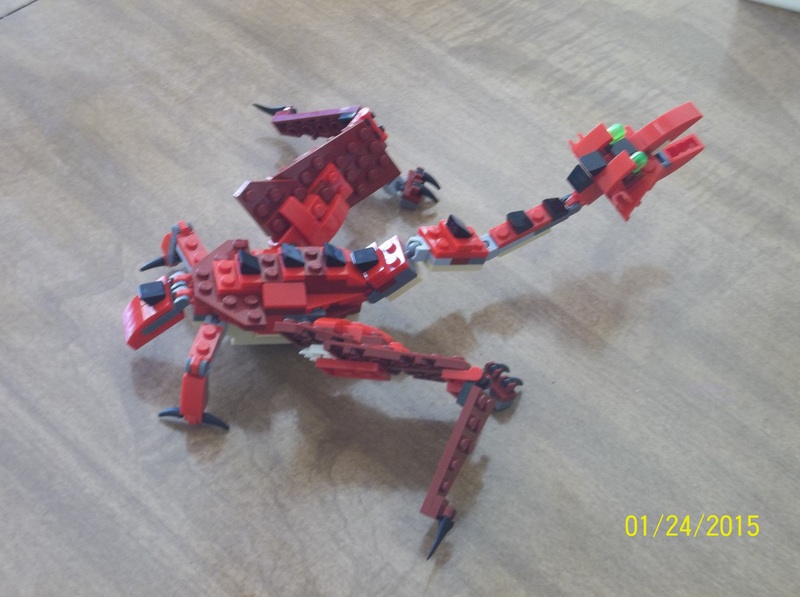 It’s a nice little set; I’m particularly fond of the dragon and the scorpion is very nice (though the biologist I trained as cringes at its wrong number of legs), though I’m less fond of the snake. Anyway, having followed typical pattern and built the three things there were instructions for, I decided to see about a fourth alternate. I’m quite into dinosaurs and other prehistoric beasties, and I was initially thinking about adapting the dragon into a Tyrannosaurus rex, but then I decided that was too similar. Rip the wings off and you virtually have it. So after rejecting the idea I decided to have a go at that monster pterosaur, the Quetzalcoatlus. Freakishly large flying things. More reasons to love the Cretaceous! 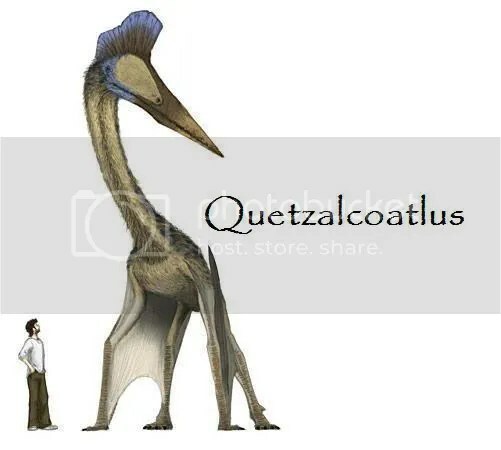 Quetzalcoatlus is awesome in its own right. I mean, the thing stands on its feet and wing-arms as tall as a giraffe, and it flew! And they think it was an aggressive predator that ate some of the smaller dinosaurs, and the young of larger ones. 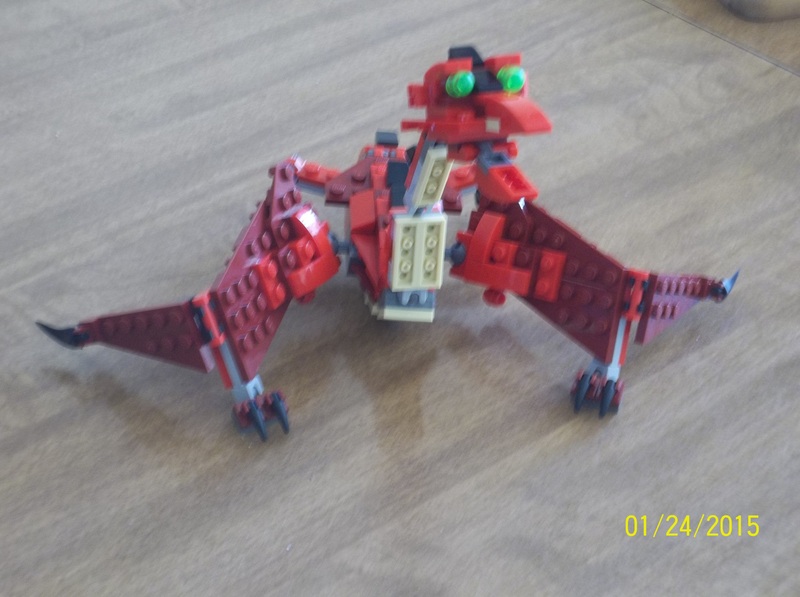 Anyway, here’s my Lego Quetzalcoatlus, posed on the ground and with the wings and legs arranged for flight. 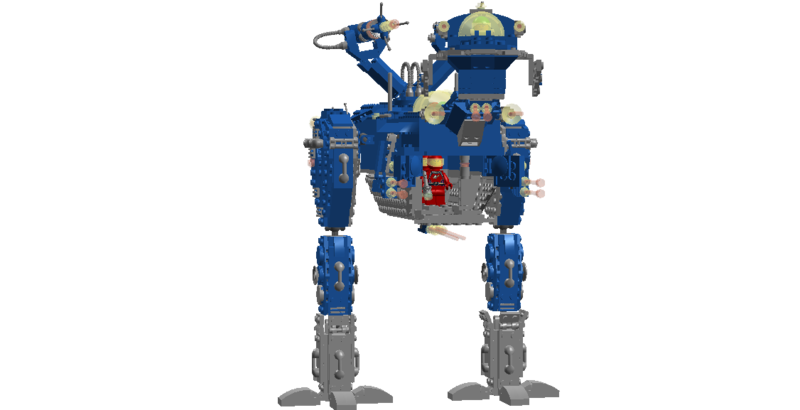 The head might have been more streamlined if I’d had a red 1×1 double SNOT brick to work with for attaching the eyes, but a) I don’t have one of those, and b) I wanted to use only the bricks found in the 31032 set. Sorry about the shaky camera. I got better with taking the photos, really I did. Arranged for flight. Broader wings might have been a little truer to life, but you work with what you have. 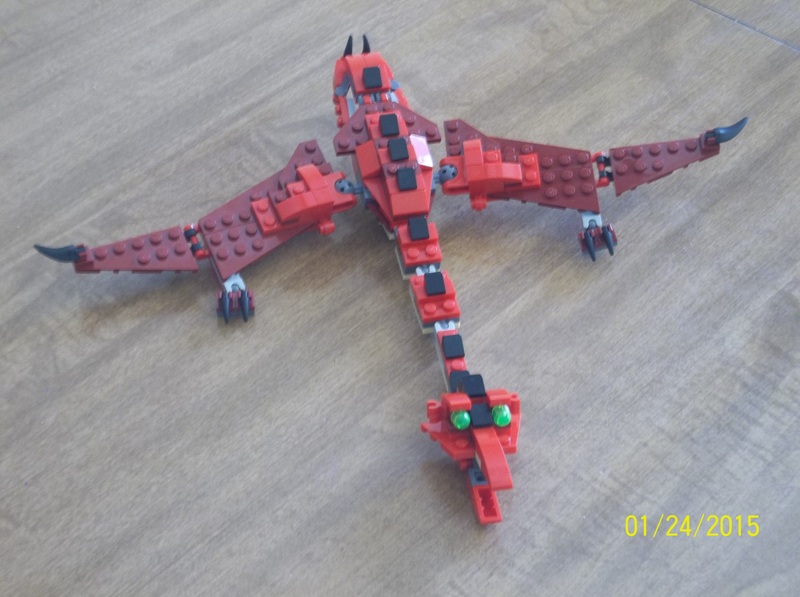 Front view in flight mode. 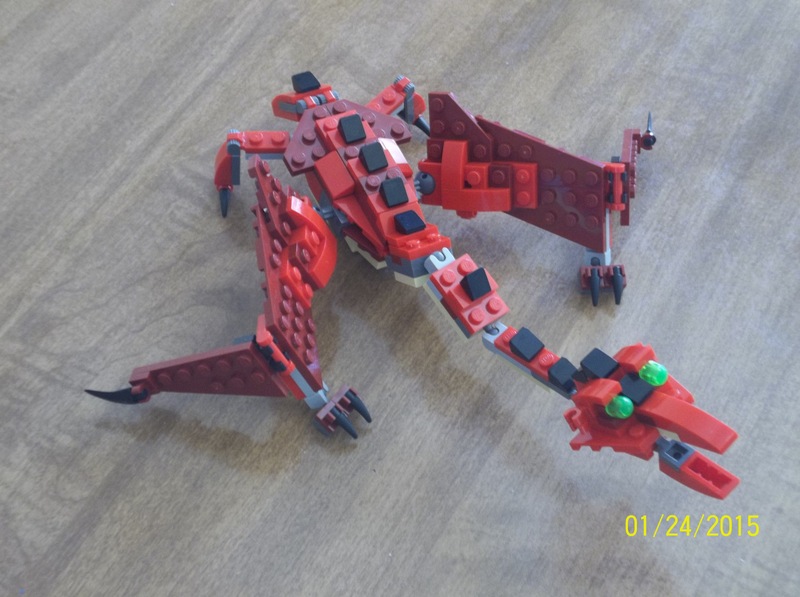 This entry was posted in Alternate builds, Prehistoric beasts and tagged Lego, Lego dinosaurs, Lego sets, Pterosaurs, Quetzalcoatlus on January 26, 2015 by geoffhorswood.